Later this week we will be releasing our 400th full length episode and next month will mark the 4th anniversary of the release of the first episode. We understand that this isn’t really much of an accomplishment, aside from the fact that we are not quitters, even though this show has not made us any money and we are thousands of dollars from breaking even at this point. Anyhow, to Mark this uneventful occasion we are encouraging all of our listeners to leave messages on our hotline or Skype wishing us a happy anniversary or if you prefer you can call and insult us about how ugly we are and how we are a just a couple of arrogant know-it-alls. That’s your choice. 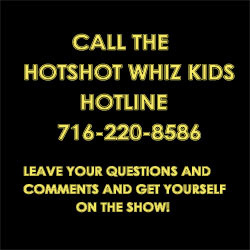 Just leave a message on our Hotline: 716-220-8586 or Skype us at hotshotwhizkids and you can be a part of the special look back we have planned for next month. Be sure to leave your name and town as well!